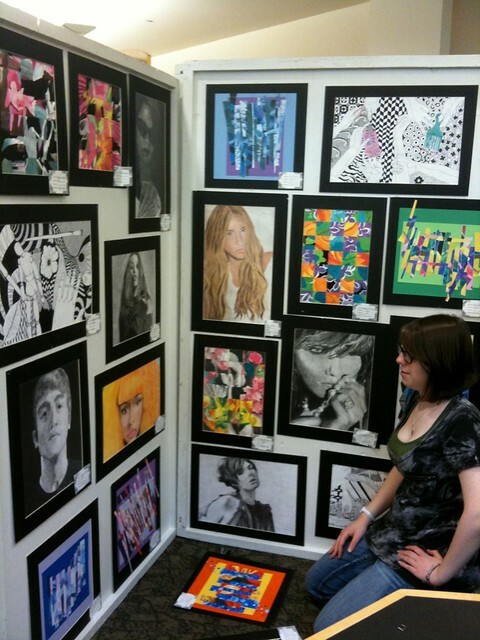 The Algonquin Library is the site of the Jacobs High School Art show May 3 – 18, 2011. Algonquin area Freshman to Senior students as well as those in Advanced Placement Art classes recently displayed their art projects at Spring Hill Mall in West Dundee. This morning, students and art teachers moved the artwork to the Algonquin Library for the 8th annual student show. AP art teacher Tisha Ellis and ceramics teacher Bjana Lune were on hand to help students set up the 300-400 pieces on display. “As part of their course work, Advanced Placement Art class students are required to complete projects like organizing and setting up the art show,” Ms. Ellis said. Art was posted on temporary display boards and in display cases throughout both levels of the Algonquin Main library. AP student Ricardo Cienfuegos was setting up works from Ceramics 1 and 2 art classes in display cases throughout the library. He explained. “These are some that were done throughout the year. We are helping set these up, from jewelry, all the way to bigger sculptures, down to even more three dimensional pieces in which students incorporate stuff from other own lives, to even really big sculptures. We talked to several students about their artwork. Other students installing artwork were Jen Rood, Angela Wyant, Kristen Schlosser and Amber Maag. Visit the art exhibit at the Algonquin Library and vote for your favorite piece. Click on the picture below to watch this episode of “Where Are You Today?” as we visit to the Algonquin Public library where you can see more Jacobs student artwork.